I love games. Playing Monopoly, Life, and Sorry are a large part of my childhood. When I was in college there were countless all-nighters, not studying, but playing Spades or Hearts. And don’t get me started on Trivial Pursuit. I can pull answers out of the recesses of my brain like no other. Especially the 80’s Edition. 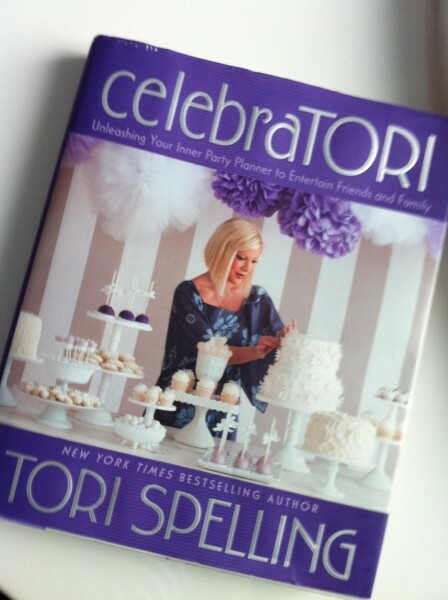 So, when I recently purchased Tori Spelling’s “celebraTORI” book, I knew she and I were kindred spirits, as her book is filled with party ideas, including tips for hosting a game night. Granted, I had seen her putting the book together and watched her throw all of the parties on “Home Sweet Hollywood,” but now I actually had the book, purchased for $6 at TJ Maxx. There it was, on page 213, Game Night. Yes! I have wanted to host a game night for a while, but didn’t know many people who liked games as much as we did. But to be honest, as much as we like games, there hasn’t been much game playing in our house besides Candy Land, Old Maid and Tinker Bell Dominos. Not quite what I had in mind. But, one day during random conversation, the topic of games came up with our neighbors, and game night was on! I used Tori’s book for inspiration, but come on, I’m not sending out hand crafted invitations for a neighborhood game night, nor am I slaving in the kitchen all day. Her budget and my budget were obviously not kindred spirits, but I did gain some décor tips. Ironically, the game we discussed in that conversation, a game called Celebrity, which I played with some friends on a recent trip to LA, and was the inspiration for game night, I completely forgot about when the planning started. We had six couples, and set up 3 tables, each with a different game. We pulled a number out of a hat to determine which table we would start at. Then, for each round, we were going to pull a new number, so that hopefully, we would move around and mingle and play each game with different people. Only, I made a dreadful mistake. One of the games I chose to play was Life. I remembered how fun it was and how I loved playing it as a kid. I thought it would be retro and cool. Life was long. We didn’t remember how to play, so we had to read the directions at every turn. Those of us at the Life table were there for the first round. And for the second round, and the third round and the fourth round. Meanwhile, the other guests played each of the other two games, Scattergories and Yahtzee, multiple times. Even though everyone had a lot of fun, we were over game night. So we drank. For drinks, we had beer and wine and I made a special drink for the party. Mix all ingredients in a pitcher and serve over ice. For eats we had some light snacks, some chips and dips, warm greek dip and pita bread, and Manwich sliders. This was definitely one of, if not the, least stressful party I’ve ever thrown. The reality is, throwing a party doesn’t have to be fancy like Tori Spelling’s. I guarantee my game night was just as fun as hers. Because it doesn’t matter how clean your house is, if your food is homemade or from a can, or what the invitations look like. It’s really about your friends, and having someone to laugh about life with. And let’s face it, beer helps.